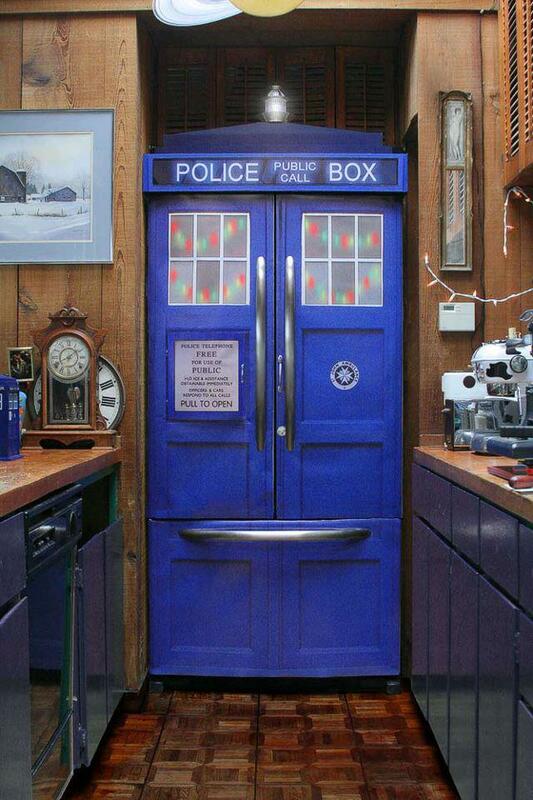 Overall there are a lot of things I like about my kitchen. It has plenty of space for my gigantic kitchen table. There’s also a whole section that works as an office area with two computer desks and three shelving units. The only real problem is the lack of storage. When I went to my annual homeschool convention this year, I was looking forward to the talk by Colleen Billing on reorganizing the kitchen. I tried to take as many notes as possible while dealing with an active toddler, and I was more than happy to shell out the money for her DVD that goes through her own house room by room offering suggestions. By the end of the day I was brimming with ideas. First Mrs. Billing suggests you should figure out your vision for a certain space. My vision was to have a kitchen where if you removed something from a cabinet or off of a shelf fifteen other things wouldn’t fall out. I knew that part of this would mean culling unnecessary items, and part of it would mean making better use of the space I had. 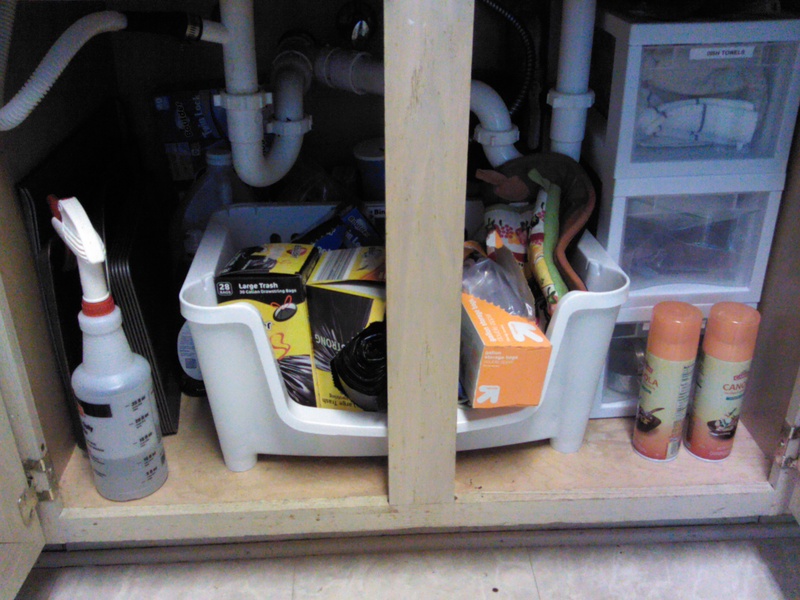 Mrs. Billing’s second suggestion was to figure out how to best utilize the space under the kitchen sink. I immediately pulled out my measuring tape and started making notes and diagrams of how much space I had to work with around the pipes. Then I started browsing the internet for the best containers to fit my needs. The next morning I bought three narrow drawers by Sterilite and an open-front stacking bin at Wal-mart. The three drawers fit perfectly in the space to the right of my pipes. I was able to move all of my dish towels, all of my sponges, SOS pads, and cleaning rags, and all of the cooking utensils that I only use once a month or less into the drawers. Then I moved all of the plastic baggies, garbage bags, foil, and cooking mitts to the open-front bin, which fit just in front of the pipes. There was still space for other things underneath and to the left of the pipes. 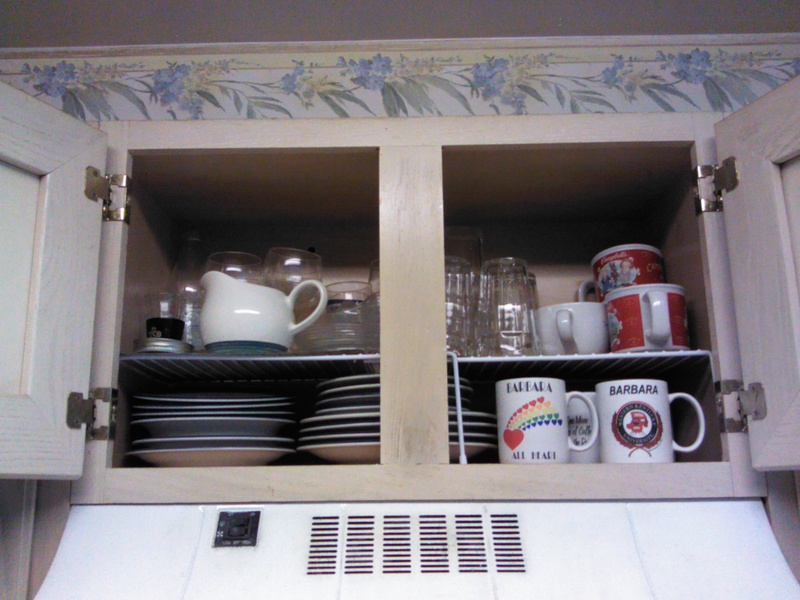 Starting with the cabinets under the sink set up a chain of organization. I was able to move all of the bibs that once sat in a bigger drawer to the more narrow drawer where the dish towels had been. 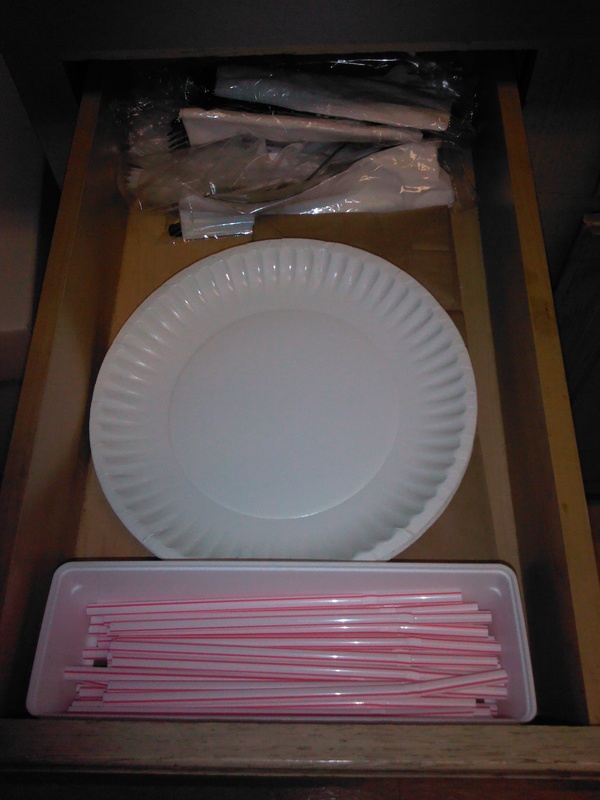 In the bigger drawer I had space to put the straws (where the kids could get them for themselves), paper plates (getting them off the kitchen counter), and plastic forks/spoons. 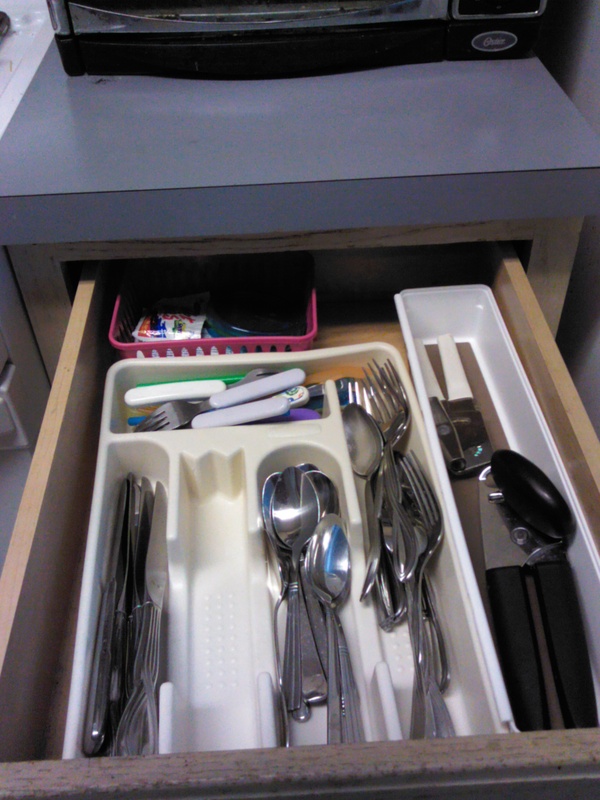 The old bib drawer/new disposable eating drawer. 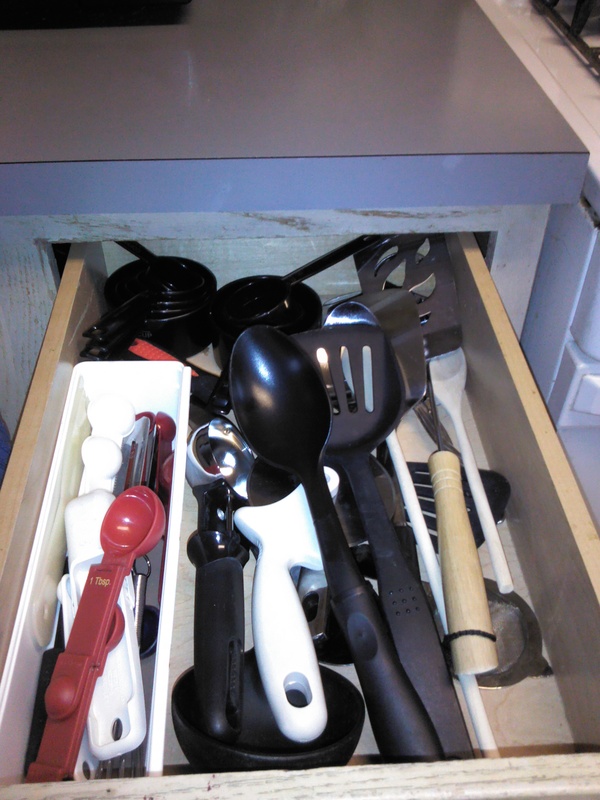 Moving the lesser-used cooking utensils freed up enough space in the regular cooking utensil drawer to easily shut the drawer without lots of shoving and cursing. It also opened up enough space to fit the dry measuring cups, which had been homeless for months, and relocate my measuring spoons from the eating utensil drawer. Look Ma, I close on the first attempt! In the eating utensil drawer I cleaned out old sauce packets which we always save and never use. Where the measuring spoons used to reside, I now had space for all of the baby/toddler utensils, which formerly lived in a small basket in my pantry. The small basket fit right in there as a prime location to keep wet wipes instead of in the junk drawer. It looks like all of the forks are in the dishwasher. What about the junk drawer? One of the other things I picked up during that first Wal-mart trip was this 6-piece drawer organizer. Two of the pieces I used in other drawers, but the other four I put to work in the junk drawer. 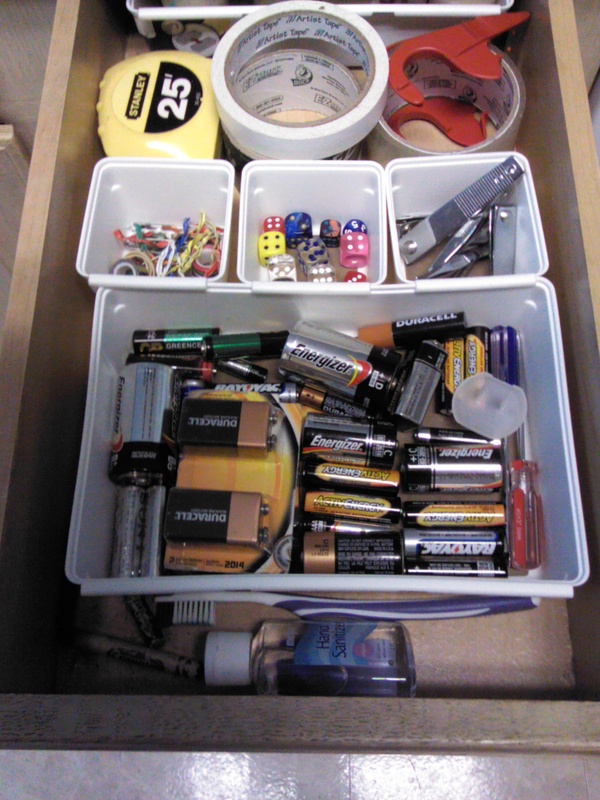 The larges bin works well for all of our batteries. The three small ones work for bread ties/rubber bands, dice (used a lot in school work), and small screwdrivers/nail trimmers. Another small bin that I picked up on a separate trip fits our candles (for Halloween and birthdays). And there’s still some room for duct tape and my precious measuring tape. Now that all five of my drawers were taken care of, it was time to work on more of the cabinets. Once I moved all of the plastic baggies, garbage bags, and foils from over the stove to under the sink, I had to figure out what I wanted to put over the stove. Obviously, it had to be something that wouldn’t be destroyed by heat. Since my mother-in-law, who lives with us, is shorter than me, I didn’t want to put anything she would use regularly I decided that was a good place to put plates and glasses that aren’t used as often and to move my coffee and soup mugs. I bought an expandable wire shelf in order to make the most of the space. Can you spot Big Red in the picture? Moving out the extra dishes made more space in the regular dish cabinet for all of the small baby bowls. It also made it easy to get a single dish out with fewer contortions than the Millennium Falcon in an asteroid field. I put my rarely used baking mixes and ingredients from the pantry on the top shelf. Then it was just a matter of straightening up the medicine shelf and the spice shelf. Bowing shelves or an optical illusion? You decide. What I had done so far whittled quite a few things out of the pantry, which was the most likely to be over-stuffed to the point of having an avalanche. I decided to only keep the things we use most often in the pantry: snacks, open condiments, lunch items, and cookware. I bought some more wire shelves to build more vertical space and prevent less toppling in the pantry. I already had the wire basket, and I found that the cardboard trays from cases of Ramen cups make great shelf baskets, too. The drawer is great for storing all of those individually wrapped items the kids eat (granola bars, fruit and grain bars, peanut butter cracker sandwiches, etc) and I can fit all of our fruit cups on top of it. Believe it or not this is better than it used to be. I really didn’t know what to do with the popcorn bowls, colanders, and extra paper plates. Sue me. 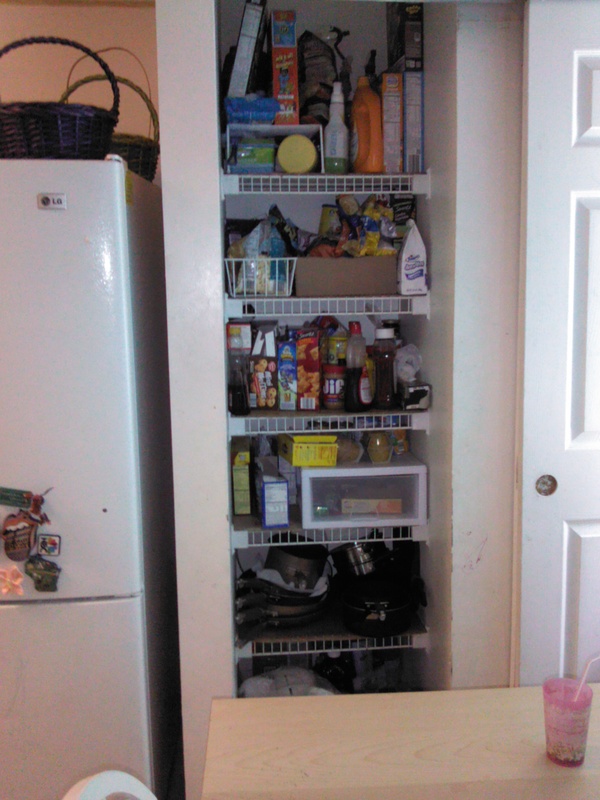 Dinner supplies and extra packages of snack foods and condiments were moved to the cabinets under the large counter. Another wire shelf with a Ramen box as a basket/drawer again built more vertical space in the back of the cabinet. 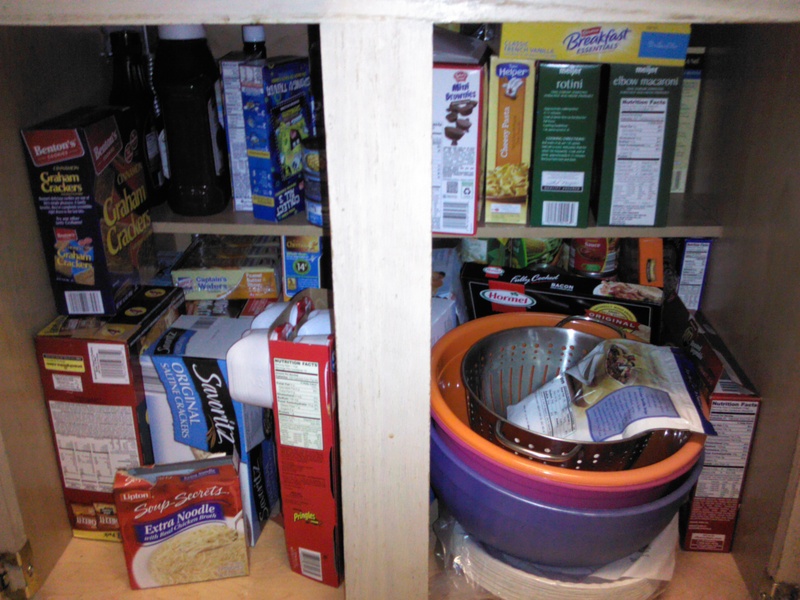 The perk of small baskets is that you can easily remove an entire basket of food to get to the stuff behind it without the individual items toppling everywhere. Colleen Billing has a rule that you should only keep on your counter things that you use every day or every other day. I tossed unnecessary space wasters, like the fourth piece of my canister set that served no purpose and a large wooden bill box that had become a junk collector. Next it was just a matter of finding a home for my large crock pot. This led me to the cabinet I refer to as The Black Hole. It’s an awkward corner cabinet where things disappear into the abyss. Once I dug everything out, I was able to pare down a few items. I figured that two Corningware baking dishes that I never use was better than four Corningware baking dishes that I never use. With the help of another wire rack, less-used items went in the back, while the most-often-used items were put closer to the door. 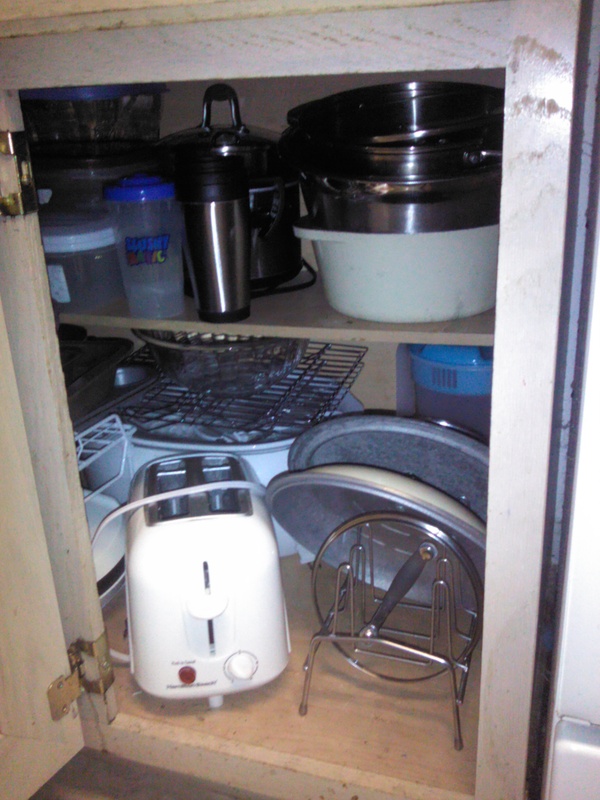 I even had space to put a lid rack and keep my toaster off the counter. It took about a week to do the majority of the changes. (Mrs. 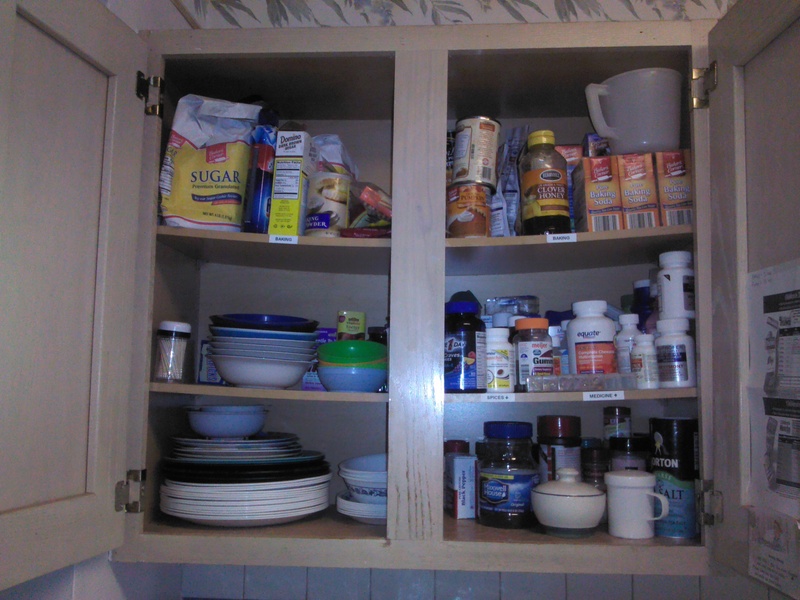 Billing estimates it takes about eight to twelve hours to thoroughly reorganize/clean the kitchen.) I didn’t even try to do anything in the refrigerator. Unless it magically turns into the TARDIS, there’s not much else that I can do. We already bought a mini-fridge last summer for extra space. It took us a while to remember where things are, but over-all I think the changes have been more efficient. Some of the changes have enabled the kids to be more self-sufficient, especially the recent addition of a large step stool. The changes have also inspired me to work harder to keep the kitchen clean and organized. This entry was posted on September 2, 2013 at 1:53 pm and is filed under Family Life. You can subscribe via RSS 2.0 feed to this post's comments. You can comment below, or link to this permanent URL from your own site.